Credit cards and budgeting don't go together well unless you are very disciplined with your use of them. Most credits cards charge very high interest rates, which can cost you hundreds or thousands of dollars each year. What's worse is the temptation to see your credit limit as an extensions of your available money. This can lead to growth in debt to the point that you can't easily pay it off. It's an insidious trap that sneaks up on you. The right way to use credit cards is as a deferred cash account. This means that you treat the balance of your credit card as money spent out of your bank accounts and not as an extension of them. If you only spend the money you earn and pay off your credit cards before they charge you interest, you will be in great shape. Why use credit cards at all? Reward points - You can earn free trips with airline miles or cash back. Purchase protection - Many cards extend warranties or allow charges to be disputed. Rentals - Renting cars or reserving hotel rooms is safer on credit cards. If you don't keep a balance on your credit card, then it's not considered debt. You can then set it up as a cash flow account along with your bank accounts. If you do carry a balance, then you'll need to make sure to pay down your debt. 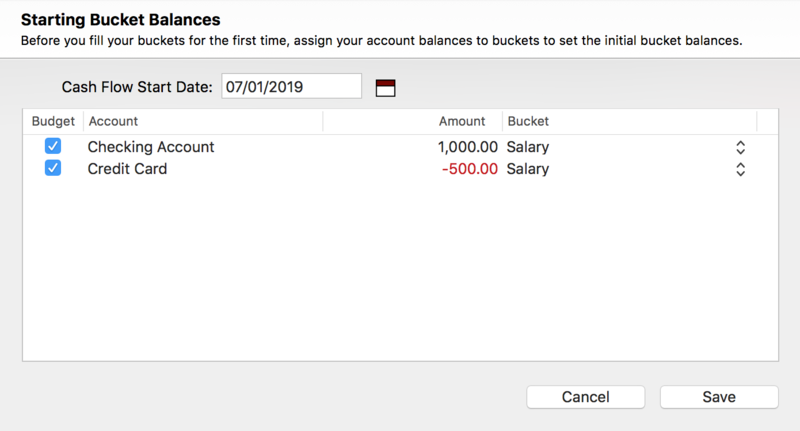 Since the balance on your credit card is going to be paid off each month using your bank account, assign the negative amount to your primary income bucket where you assigned your primary bank account balance. This gives you the "real" income balance for spending so you don't double spend the income you have on your credit card. Remember that your credit card is actually a deferred cash account in this scenario. Every purchase made on your credit card should be assigned a bucket. Treat your transactions as if they came out of your income. When you pay your credit card bill, don't assign a bucket. Since this is one of your cash flow accounts, you don't need to track this money. All you're doing is moving it between accounts. You can even set this payment up as a bank transfer so there MoneyWell automatically assigns the transactions as "bucket optional". If you are carrying a balance, then you should focus on paying down your credit card. 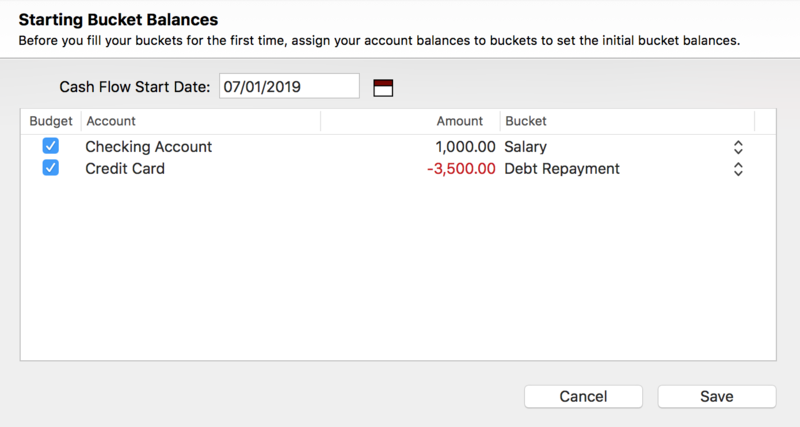 Since you need to pay down your balance a little bit each month, then you should assign the debt to an expense bucket—named something like "Debt Repayment"—so you can track your progress. In this case you will need to add a few steps to keep your buckets in balance, but you should still assign every purchase to a bucket. When you pay your credit card bill, assign the both the withdrawal and the deposit transactions in the transfer your credit card to your Debt Repayment bucket. This allows you to keep your buckets in balance with your accounts. If you don't assign both sides of the credit card payment transfer, you'll see a discrepancy. You have to make sure to cover your credit card spending with either income bucket or your debt bucket. If you are continuing to increase your debt with your credit card spending, you should assign your credit card spending to the "Debt Repayment" bucket. You lose the ability to categorize your spending. If you want to track your spending that you are doing with your credit card and pay down your debt, then you'll need to split your credit card payments. For every transaction that you pay on your credit card, you'll need to split that amount off of your credit card payment deposit and assign it to the bucket for that spending. If you are paying more than what you spent this month in transactions, then assign the remainder to your "Debt Repayment" bucket.